What would it take to tear you away from Maui’s gorgeous beaches? If you love good food, especially of the local and sustainable variety, I can now suggest several dozen reasons to put down the tanning lotion and pick up a knife and fork. Maui is home to a booming food scene centered on the truly vast array of things that can be grown, caught, raised, and created on its 729 square miles—the second largest of the Hawaiian islands. 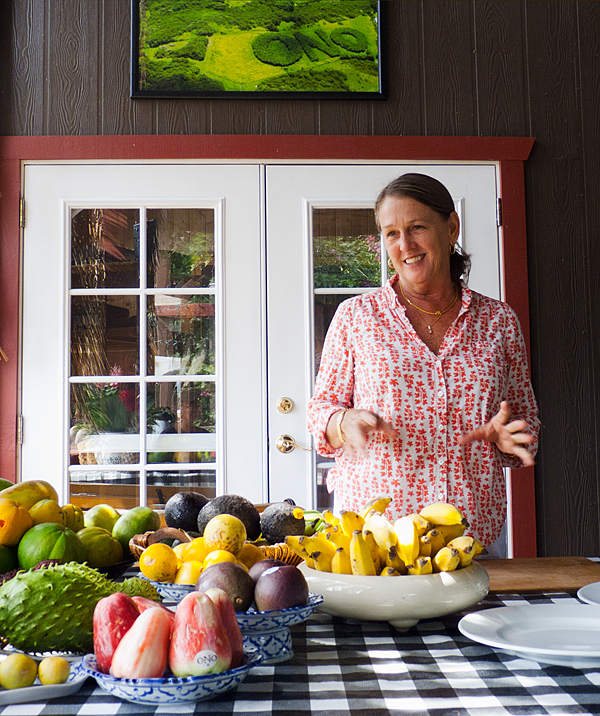 In just six days recently, we tasted everything from the expected pineapples and macadamia nuts to local lamb, goat cheese, strawberries, and honey. We had out-of-season mangoes that were heartbreakingly luscious. And unexpected treats like egg fruit, chocolate sapotes, Surinam cherries, and Maui coffee. There was even a local organic vodka called Ocean, made with sugar cane and distilled sea water. When we return next year we might even get to sample Maui-produced blueberries and—believe it—olive oil. To understand all this, a little geography lesson is in order. Maui is dominated by 10,023-foot Haleakala, a dormant volcano. Occasionally there is snow on top. Want to grow cool-weather crops like grapes? Just head up the fertile slopes. Need more rain for your bananas? Go east, towards the rainy windward coast. Now add a growing number of chefs dedicated to doing business with local farmers and fishermen, a vibrant Slow Food chapter putting on regular tastings and tours, and you’ve got one tasty food scene. We started on the north shore, a few miles east of the airport, in the funky crossroads village of Paia. Once a town built on sugar cane, it’s now a seriously laid-back refuge for surfers and stoners. (I can’t vouch for the pakalolo, but the waves here are awesome, dude.) We could easily have spent a relaxing week here, inspecting the growing number of excellent art galleries and restaurants. Flatbread Company (808/579-8989), which pulls beautifully-charred pizzas out of its wood-burning oven, won a Friend of Agriculture award for using local ingredients. They even make their own chocolate sauce from Maui cacao. Across the street is the even more causal Paia Fish Market (808/579-8030), where the ultra-fresh catches of the day—often snapper, wahoo, and tuna—are charbroiled and served up as soft tacos or burgers. The Paia Inn (808/579-6000), set smack in the center of town, looks like a place cobbled together by footloose hippies, but has stylish suites and highly professional service. “When the owners built this place, they put in double-glazed windows and poured sound insulation between all the walls,” says Carly, one of the charming hosts. Paia Inn also has some freestanding bungalows running down to the beach. After a peaceful night, we headed upcountry in search of the obvious: pineapple. A century ago, Maui was practically synonymous with pineapple. Today, smaller producers determined to offer a quality product can still make their mark. At Hali’imaile Pineapple Company, president Darren Strand told us that 70% of their sales are within the state of Hawaii. 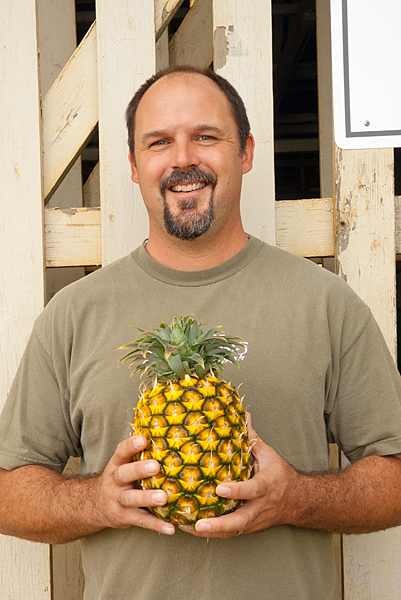 That said, if you send in an order from anywhere in the country, Darren or one of the other owners will go out in the field and pick an extra sweet, low-acid Maui Gold pineapple for you, then ship it via FedEx. A few miles east is Makawao, an old ranching town that’s recently become a charming blend of upcountry and upscale. There are some fine women’s clothing boutiques and, every Thursday morning, a farmer’s market in a vacant lot on Baldwin Avenue. 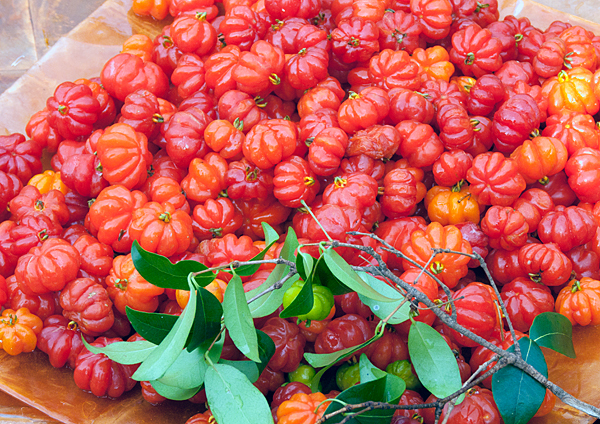 Maybe a dozen vendors show up with coconuts, papayas, bananas and—new to us–Surinam cherries. Our small bag of the tart, peppery fruits came from a Summer of Love veteran who grew them in her front yard. Makawao also boasts one of the best restaurants on the island. The two-year-old Market Fresh Bistro (808/572-4877), with a chef from New York’s Union Square Café, has made a big impression on Maui’s local food scene. Dinner one night included roasted leg of lamb from the slopes of Haleakala and fresh swordfish over a bed of spring onion risotto. Do not miss this place. The next morning we left the Paia Inn at 7 a.m. for the drive to Hana. The Hana Highway is every bit as beautiful as advertised, 36 coastline-hugging miles with more twists than a Dan Brown novel. Hana itself is a zero-stoplight blip, but we were headed another five miles down the even-hairier road to what promised to be tropical fruit heaven. 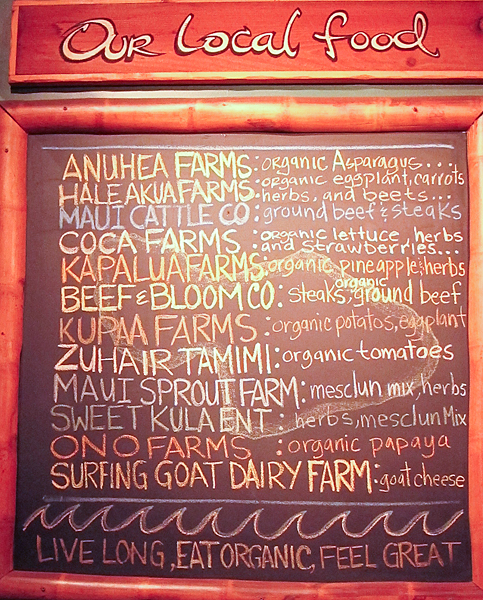 Lilly and Charles Boerner have owned Ono Organic Farms ( 808/248-7779) for 35 years. Every weekday at 1:30, by reservation only, Lilly or her daughter Autumn conducts a tour and an extensive tasting of whatever is ripe on their 50 lush acres. Sitting on the covered porch of the charming wood home, my wife and I bit, sucked, slurped, and chewed our way through 15 different fruits as Lilly regaled us with facts about the farm and how each is grown: Apple bananas, far sweeter than the dull variety back home. Intense papayas. Eggfruit, a dead ringer for creamy yams. Custardy chocolate sapote. Soft white rambutan. Jackfruit, guava, mountain apple, cacao nibs, coffee beans, honey and jams. It’s the Garden of Eden, totally off the grid except for a phone line. Sign us up. After the long drive back, we were happy to bed down at The Old Wailuku Inn at Ulupono (808/244-5897), a 13-room bed and breakfast that dates to 1924. The plantation-era main house has been tastefully updated, the beds draped with fine Hawaiian quilts. Owner Janice Fairbanks mingled with an eclectic array of guests during the justly-famous breakfasts. One morning over French toast we traded notes with Bonnie Friedman, who leads food tours to Maui restaurants and farms. She also offers personalized Maui restaurant guides called Cuisine Confidential, which I highly recommend ( 808/242-8383). By now, Maui’s beaches were definitely calling us, so we pointed our rental car for the west side of the island. First stop: Yee’s Orchard in Kihei, to stock up on the most fragrant mangoes on the planet, then lunch at year-old Star Noodle in Lahaina (808/667-5400). Not for nothing has sleekly hip Star Noodle, set in an industrial park above town, been nominated for James Beard Awards this spring, for Best Chef and Best New Restaurant in the Pacific region. The array of share plates and noodle dishes included a sparkling salad made with local fiddle head ferns, old-fashioned “fried soup” with thick chow fun noodles, and the finest tofu dish we’ve ever tasted, broiled cubes with sautéed local mushrooms and red miso. We didn’t have time to try all the Kapalua restaurants, but we couldn’t resist the Pineapple Grill (808/669-9600), which last year was named the best restaurant on Maui by Honolulu magazine. Highlights included a slab of supremely fresh ahi coated with pistachios and wasabi peas, served with sautéed mushrooms—an umami-rich combination perfect with a pinot noir from their deep wine list. Oh, and the most luscious pineapple upside down cake ever. But the real eyebrow-raising meal came at the Ritz-Carlton itself. The Banyan Tree dining room had been under the command of chef de cuisine Jojo Vasquez for just a few weeks, but he’d already made his mark. Dishes such as his ahi kampachi ceviche with green mango and coconut, and roasted hapu (a local sea bass) with island mushrooms and lemongrass foam showed both a delicate hand and a way with bold flavors. 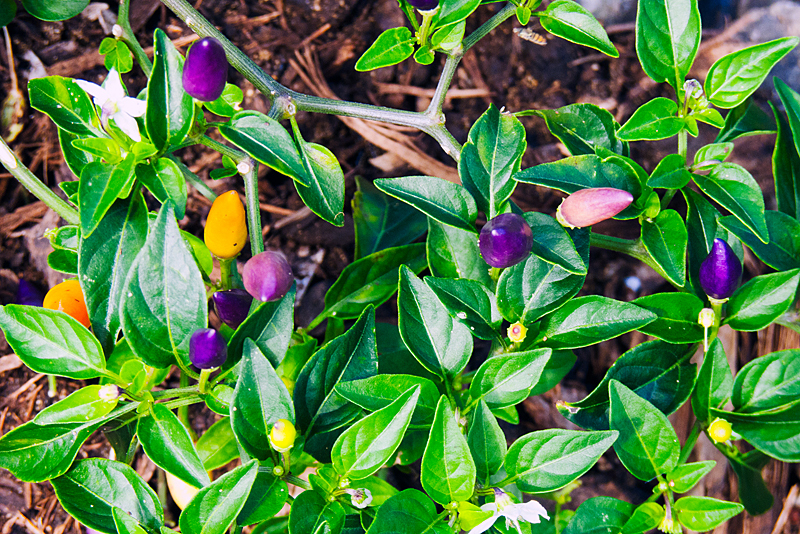 He’s planted a big new garden on the property, growing eggplants, peppers and lots more. “We’re about to convert a couple of the tennis courts to aquaculture, and raise fish,” he told us. Another net gain for food lovers. For more information, consult the excellent website gohawaii.com/maui. Maui Revealed, by Andrew Doughty, is a very insightful guidebook that’s frequently updated at wizardpub.com. We used to live in Hawaii and still visit regularly. Tom & Karen’s story revealed things even locals don’t know! Excellent.